General Atomics’ aeronautical systems business has received a potential one-year, $44 million contract to perform risk reduction efforts for the U.S. Navy’s MQ-25 unmanned carrier aerial system program. The contractor will develop trade space and refine concepts in support of requirements generation prior to the program’s engineering and manufacturing development phase, the Defense Department said Monday. 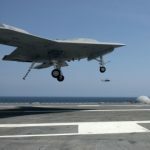 General Atomics received the contract a week after the military branch awarded a $43.4 million contract to Boeing (NYSE: BA) and a separate $43.6 million contract to Lockheed Martin (NYSE: LMT) for risk reduction measures in support of the MQ-25 carrier drone program. General Atomics will perform work under its sole-source, cost-plus-fixed-fee contract in California and Iowa through October 2017. The Naval Air Systems Command will obligate the full contract amount from the service branch’s fiscal 2016 research, development, test and evaluation funds at the time of award.